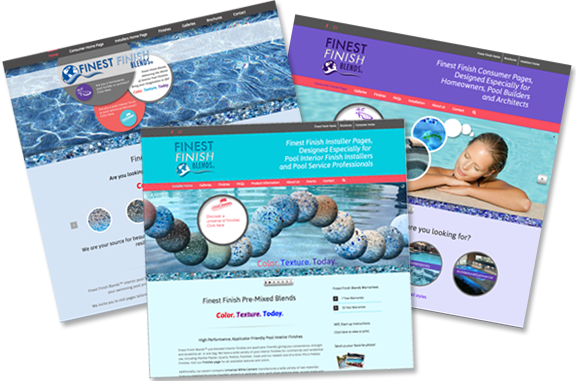 Finest Finish Blends is a division of Universal Pools in Arizona. Their beautiful pool finishes are known for their strength, longevity, durability, resilience, sparkle and ultra smooth texture. Working with established branding colors, the requirements in this case included creating three different experiences for visitors: a main umbrella type site to summarize the product offering and two related websites, one to address the needs of consumers the other to give pertinent information to finish installers. Visitors can navigate between the sites using navigation at the top of the screen and within each site suing an additional level of navigation situated under the banner.